I'm still experimenting with what brow products best suit me, but this pencil glides on very easily, allowing me to fill in the sparse areas in my brows. Although it only comes in three shades, you should be able to find one which works for you. I had my brows shaped at ULTA. Rather than using powder, the cosmetologist used this pencil to draw my sparse, invisible brows. What a difference! I had been using Brow Envy, a powder, but the pencil actually created eyebrows that really frame my eyes. The pencil is soft enough so the effect is not harsh. I highly recommend this product. This pencil is way better than the Anastasia brow pencil I have. I love how this has more of a waxy base so I can hold my stray brows in place unlike the Anastasia one that has more of a hard formula. 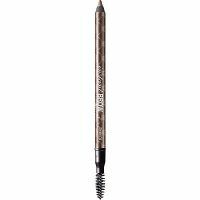 It has such a creamy texture that's easy to work with and the brows are left so natural looking (not reddish at all!) Because this pencil is so creamy, the product doesn't seem to last long due to al...read morel the sharpening and such if you use it every day. I'm still on the hunt for a bargain brand that's comparable to this one because I don't know if I wanna pay $20 each time this runs out. But otherwise, great job Benefit!! !